The above info came from atomofish, and was edited by yours truly (contact me). The image came from mecca-anime.com. Armored Trooper Votoms tells of the intergalactic war that raged between the Gilgamesh and Balarant Star systems. For the hundred years the war lasted, many worlds, lives, and civilizations were devastated in the deadly conflict between the two powers. However, the development of a new weapon called the Armored Trooper escalated the war to even more violent and deadly levels. After a century's worth of conflict in which neither side was able to claim victory, a cease fire was announced between the two powers. Peace seemed in the cards for both sides. However, after such a long period of war, many people are not ready to accept it. Those who have never known peace continue to profit from new hostilities. 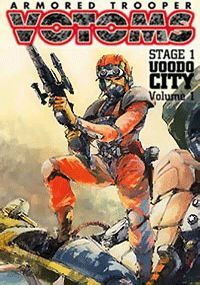 The story of Votoms begins in the last stage of the war, and with a man name Chirico Cuvie, who was engineered to be the "perfect killer" by a secret society... which happens to be the same one that's hunting him down. However, for Chirico, matters will become more complicated and the violence will escalate.